Tuckpointing – This is filling in the space between the bricks where it has deteriorated using new mortar. This can be done for the entire wall or chimney or just in a smaller area of the property. The new mortar is colour-matched to closely resemble the existing mortar on the wall. Brick Cleaning – A cleaning agent is applied to the wall and then the wall is pressure washed with a pressure washer. The bricks and mortar are safe during the cleaning and the result can be a remarkable difference that makes your property look fifty years younger! Brick Replacement – Simply removing deteriorated bricks from an area and installing new matching bricks. Parging – This is coating an area with mortar. It is usually done at the base of a property. 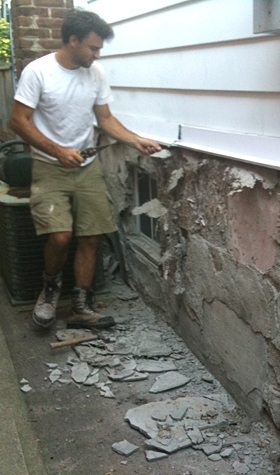 It is re-veneering the wall with new mortar to protect the wall further from the elements. Chimney Repair & Rebuild – Repair involves tuckpointing the chimney, and if possible replacing some bricks on the chimney. Rebuild is simply rebuilding the entire chimney. Stone and Brick Veneer Systems – Brick and stone veneer can transform any wall into a stunning backdrop. You get the look of brick and stone to bring more character and beauty to any room. This can be applied to almost any surface without any limitations or foundation support.